There are numerous ways to make money with options and many traders take decent gains out of the market on a daily basis. However, those in the know are able to scan the market to find the truly exceptional breakouts that can deliver gains of 100%, 200% and even 300% in just a few weeks or less by using the right combination of technical analysis and option strategy. 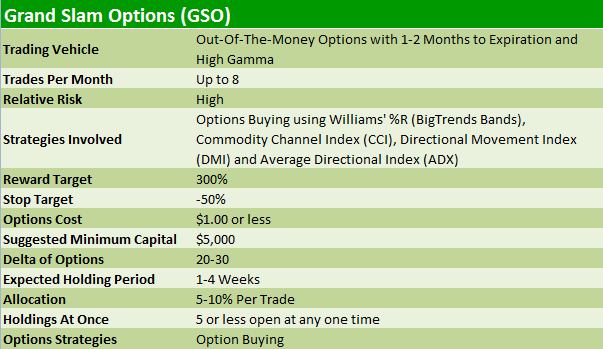 Very low-cost, out-of-the-money options offer us a unique opportunity to magnify the huge gains being made across multiple stocks in the current market. And by low-cost, that means any option priced at $1.00 or less (that's no more than $100 per contract) as these discount options can give traders of all levels huge leverage if the trends are caught at just the right time. As a member of our brand new Grand Slam Options, you'll receive up to 8 simple call or put option trades per month across a wide variety of active stocks, aiming for gains of up to 300%! 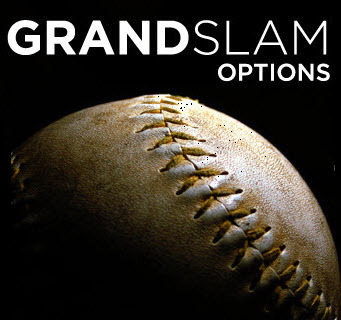 With contract prices of $1 or less, holding periods of 1-4 weeks and no more than 5 trades open at once, Grand Slam Options is your opportunity to load up the bases, swing for the fences and hit huge options home runs time and time again! New trades are usually issued within the first hour of trading (but can technically be issued at any time during the trading day) but on top of email and text alerts for every trade, we also have the option of auto-trading available at TD Ameritrade/thinkorswim and AutoShares for anybody not able to constantly monitor the markets. We never leave you hanging on a trade. We provide weekly video updates every Monday evening which give you the rationale behind any new trades with reviews of all closed positions. You will also receive unlimited e-mail and phone access to our Analyst Team for the full term of your service. Have a question about a trade or the program? Ask us!